This walk: 2015-10-13. Yennadon Crags / Click Tor, Burrator Dam, Sheeps Tor, Leather Tor, Down Tor, Devonport Leat, sluice, cairn and cist, Cross Gate Cross, beech tree, Lowery Barn, Burrator and Sheepstor Halt. Old map: Ordnance Survey, Six-inch to the mile- 1888-1913 - the car park ("Quarry") is at the bottom edge and Cross Gate is near the top edge, to the right. Previous walk in this area: 19th October 2011 2nd January 2013, 25th February 2015. Yennadon Crags / Cleag / Claig / Click Tor, at SX 5498 6794, above Burrator Upper Quarry, with Sheeps Tor behind. Sheeps Tor, SX 566 682, elevation 369 meters (1210 feet). Looking north-east, along Burrator Reservoir, with Leather Tor (left) and Down Tor (right). Zoomed view to Leather Tor, SX 563 700, elevation 380 metres (1246 feet). Another view, showing the grilles where the main part of the water goes to the water works. Walking along Devonport Leat - it was along here that the filming of the brown trout was done for the BBC Inside Out SW programme about the leat was done. A possibly etiolated sycamore tree. Quite a lot of water is running down towards the reservoir, near SX 5597 6947. 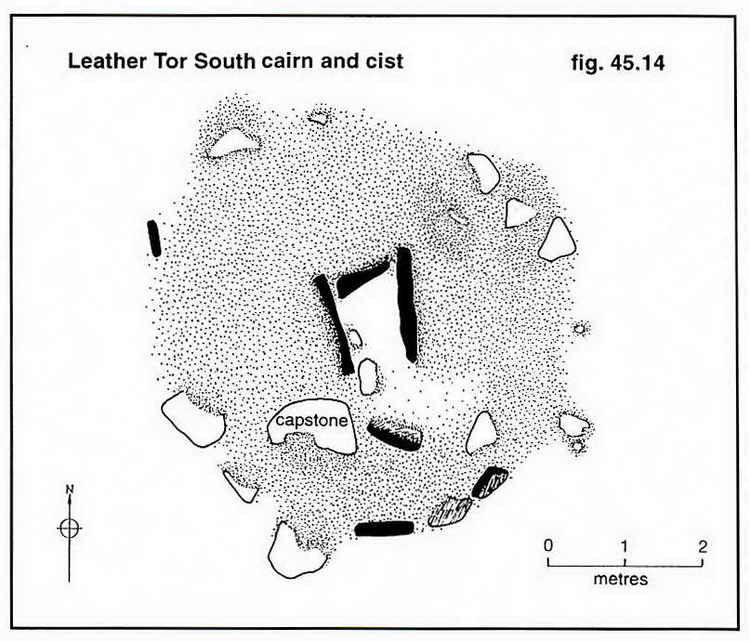 The cairn and its cist are described by J. Butler (1994), Dartmoor Atlas of Antiquities III, The South West. 45.17 Leather Tor South cairn and cist, page s 51-52. This is described as a well-preserved cairn and cist, first rescorded in 1935. The robbers trench came in the the south-east, displacing the end stone downhill where it is now partly covered by the capstone. A photograph to show the new fence - I think I have to deprecate it! The photographs from 2nd January 2013 look much more "Dartmoor". Zoomed view to the dam. An ancient beech tree - its age needs estimating! Just a view along the side of the leat..
A photograph of the water from the leat, via a pipe, that forms the Burrator Reservoir waterfall. A view from the lower flight of steps down towards the dam, showing the first flight of steps. Back to Yennadon Crags / Cleag / Claig / Click Tor, at SX 5498 6794, above Burrator Upper Quarry again. © Crown copyright and database rights 2015. Ordnance Survey. Licence number 100047373. Use of this data is subject to terms and conditions. 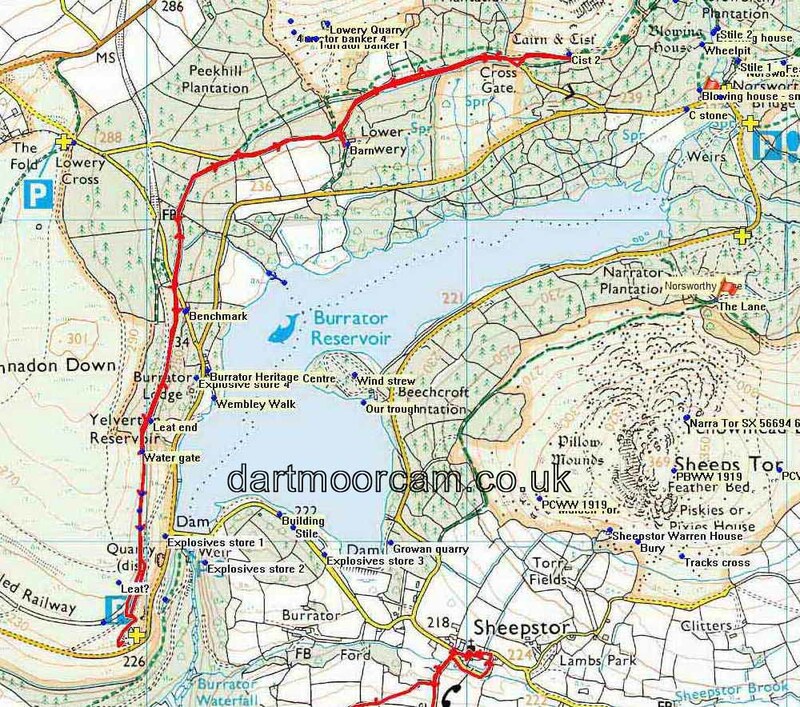 This walk was reached easily from Dousland by parking at Burrator Quarry, marked by the P symbol and yellow cross on the map. Distance - 5.88 km / 3.65 miles.